Because their father was an officer in a part of Greece inhabited by many Slavs, these two Greek brothers ultimately became missionaries, teachers, and patrons of the Slavic peoples. A decisive change in their lives occurred when the Duke of Moravia asked the Eastern Emperor Michael for political independence from German rule and ecclesiastical autonomy (having their own clergy and liturgy). Cyril and Methodius undertook the missionary task. Cyril's first work was to invent an alphabet, still used in some Eastern liturgies. His followers probably formed the Cyrillic alphabet. Together they translated the Gospels, the psalter, Paul's letters and the liturgical books into Slavonic, and composed a Slavonic liturgy, highly irregular then. Opposition continued after his death, and the work of the brothers in Moravia was brought to an end and their disciples scattered. But the expulsions had the beneficial effect of spreading the spiritual, liturgical, and cultural work of the brothers to Bulgaria, Bohemia and southern Poland. 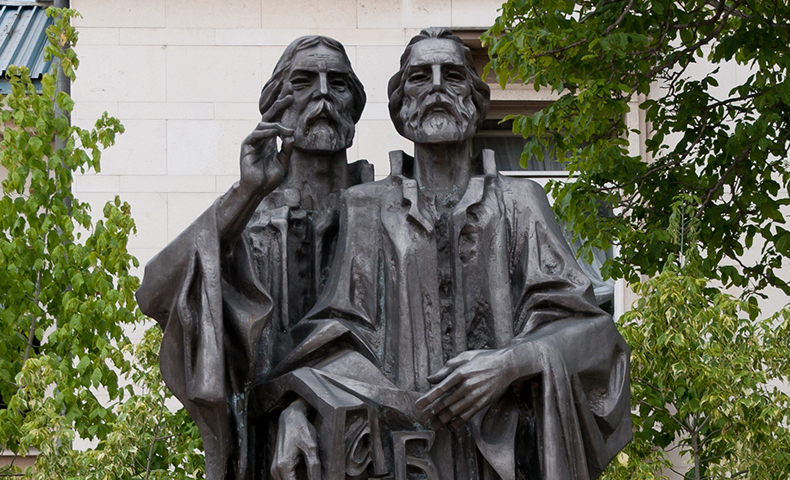 Patrons of Moravia, and specially venerated by Catholic Czechs, Slovaks, Croatians, Orthodox Serbians and Bulgarians, Cyril and Methodius are eminently fitted to guard the long-desired unity of East and West. In 1980, Pope John Paul II named them additional co-patrons of Europe (with Benedict). Holiness means reacting to human life with Godâ€™s love: human life as it is, crisscrossed with the political and the cultural, the beautiful and the ugly, the selfish and the saintly. For Cyril and Methodius much of their daily cross had to do with the language of the liturgy. They are not saints because they got the liturgy into Slavonic, but because they did so with the courage and humility of Christ.